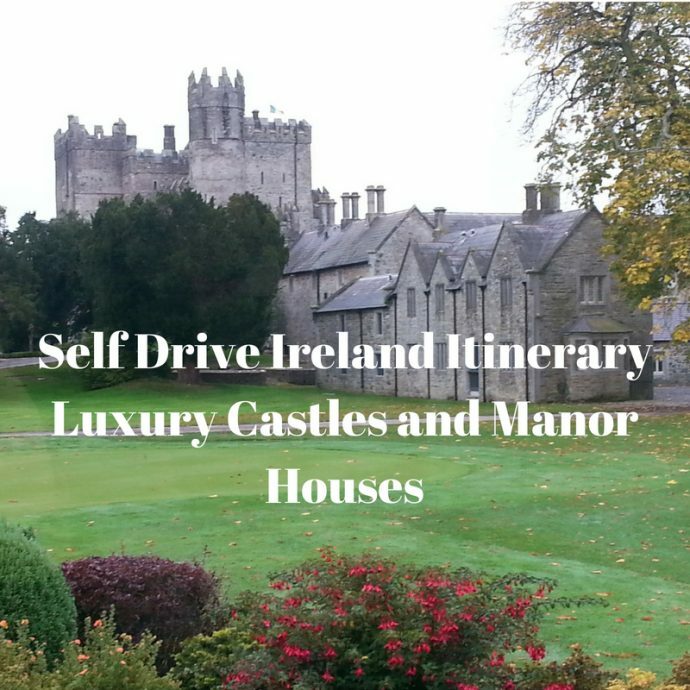 Touring Ireland on your own is easy, we have put together a self-drive Ireland itinerary that can take 2 weeks or longer depending on the length of time you have available. Ireland will capture your heart like no other country does. A fascinating country rich in culture and history, stunning landscapes, great food and of course the perfect pint of Guinness tastes better here than elsewhere in the world. They say it comes down to the water from the mountains! You just have to believe us on that one! N.B. Driving in Ireland – In Ireland, you drive on the left-hand side of the road. Our Ireland road trip takes you through some of the most breathtaking landscapes and staying in incredible historic castles and manor houses. We share with you our travel costs to assist you in planning your trips to Ireland. 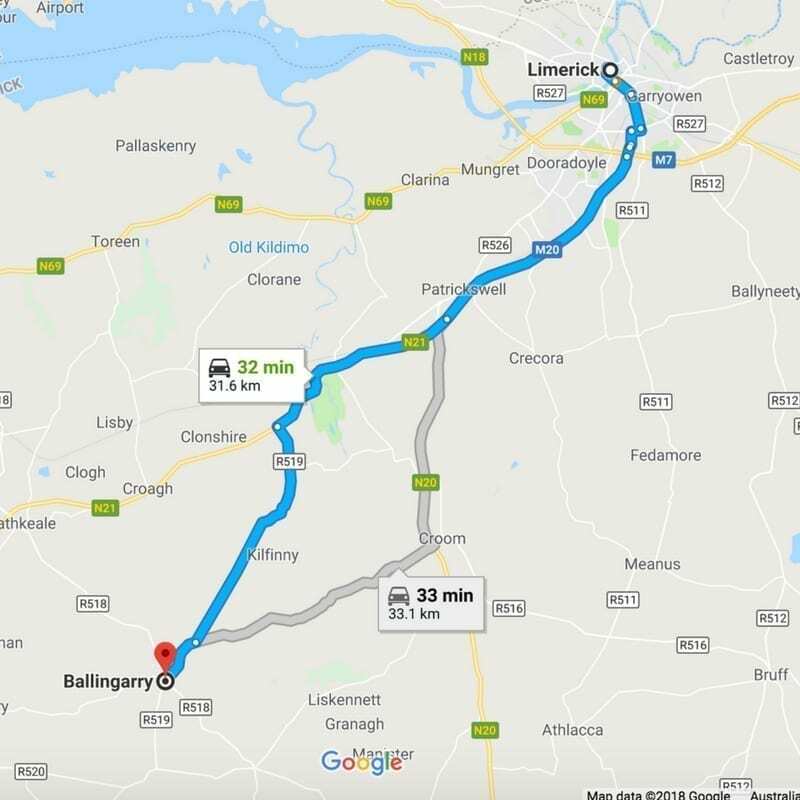 There are many Ireland tours available but this is one country where we believe you will get a better self-driving experience. 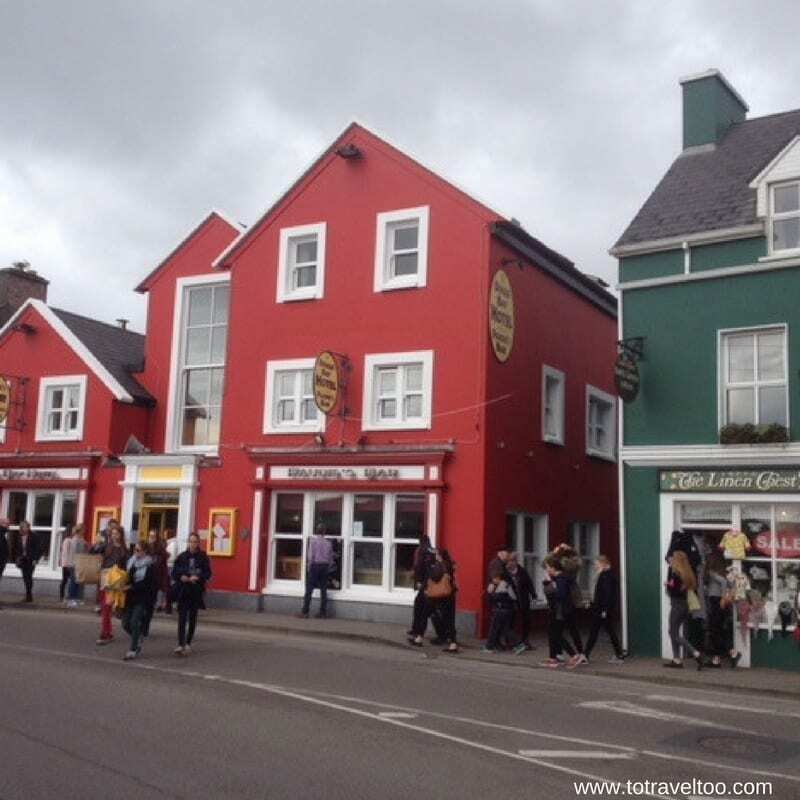 You can plan your Ireland Vacations any time of the year but the busiest time is in the summer. If you don’t mind a bit of cold and damp, spring and autumn are the best times to visit. There is one region that we must return to on our next visit is the Wild Atlantic Way. Come with us now as we take you on your Ireland travel adventure of a lifetime. 47.5 Don’t forget your hat, gloves and scarf! 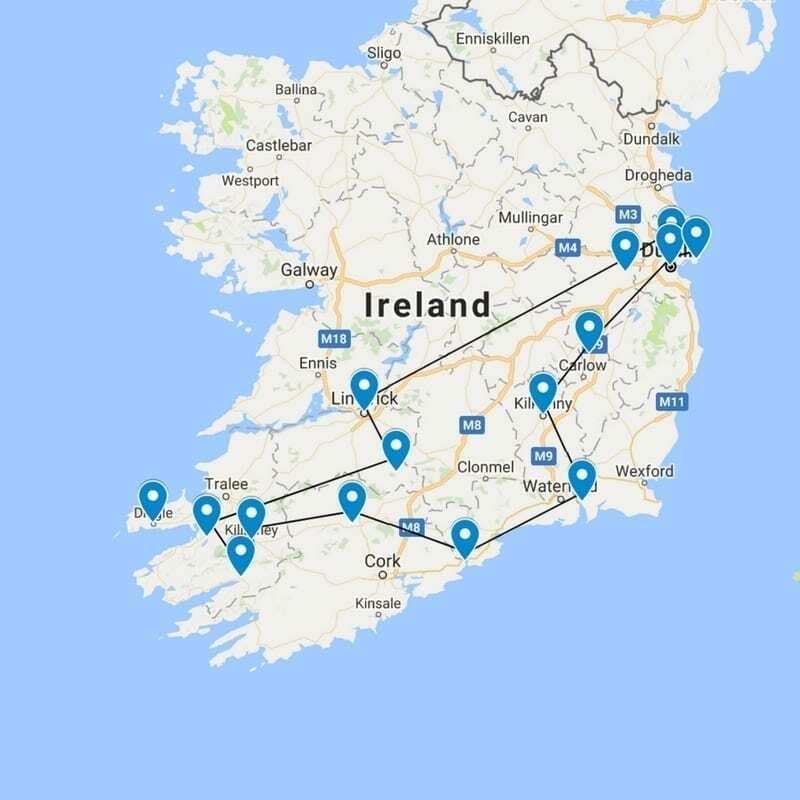 For those of you who enjoy a roadmap that you can take with you, we can recommend the trustworthy Michelin Map of Ireland. On arrival at Dublin Airport collect your rental car. We would advise that you shop around for the best rental price on the car that you require. Our rental car was booked through Autoeurope. Check car rental prices in different currencies, we have found that booking in our local home currency was cheaper than booking in Euros, even when the exchange rate was taken into consideration. As there were just the two of us with only carry on luggage we chose the smallest category which was a manual car. You will need to understand the insurance requirements clearly when booking your car rental in Ireland. All car rental companies require a large deposit that is debited to your credit card, you can expect around Euros 1000 – 2000 depending on the company and the size of the car. When collecting your car you will need to show the same credit card that was used in the initial booking. An estimation of costs for our car hire for 2 weeks was Euros 198.00. Check your travel insurance policy to see what is covered under car rental. On arrival at Dublin Airport, we headed towards the shuttle bus pick up for Thrifty Car Rental (Autoeurope). Eastlands is the location for car rental companies click here for the map location. Within a few minutes, we had checked in and collected our keys. It is highly recommended that you take photos of any scratches or dents in the car that you have hired. The photos on your phone will be time and date stamped, a handy tool if there are issues later when you return the car. You will be given a document from your car rental company that shows the current scratches and dents, check these carefully, but we still recommend that you take photos. If in doubt over anything ensure that you speak to one of the attendants and if there is a scratch or dent missing from the report, get them to add it and time and date stamp it. When we hired a car in Malaga, Spain we collected the car from a 4 storey car park which was dark inside and very difficult to see the scratches and dents on the car. As we left the airport we stopped at the first safest spot and went over the car, noting the scratches and dents on the paperwork and took extra photos. 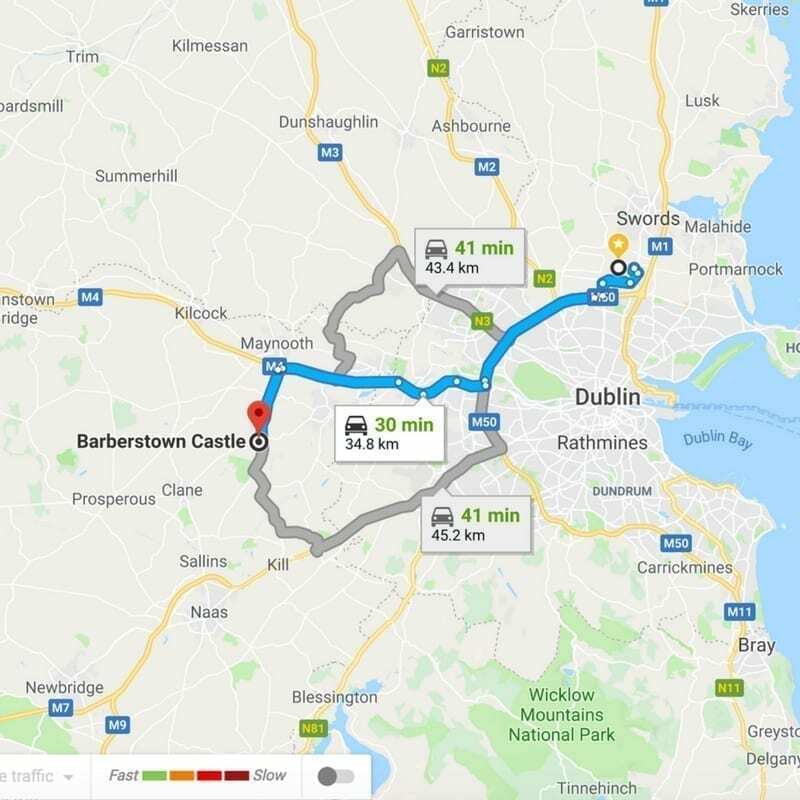 As you can see from the driving map above there are several routes to travel from Dublin Airport to Barberstown Castle, our route (blue) took 30 minutes. Barberstown Castle is one of Ireland’s Blue Book of properties. 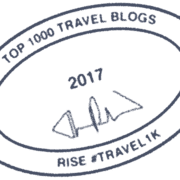 Ireland’s Blue Book is a collection of Irish Castles, Manor Houses, Historic Hotels, luxurious Bed and Breakfasts accommodation, designer lodges and 3 Michelin star restaurants in Dublin. Barberstown Castle was built during the 13th century and it nestles on 20 acres of manicured gardens. The Castle was built to protect the village and its locals from the attacks of Vi Faelain who tried to burn down the town in 1310. The singer Eric Clapton purchased the Castle in 1979 and later sold it in 1987. Since 1971 it has been operating as a luxurious hotel. 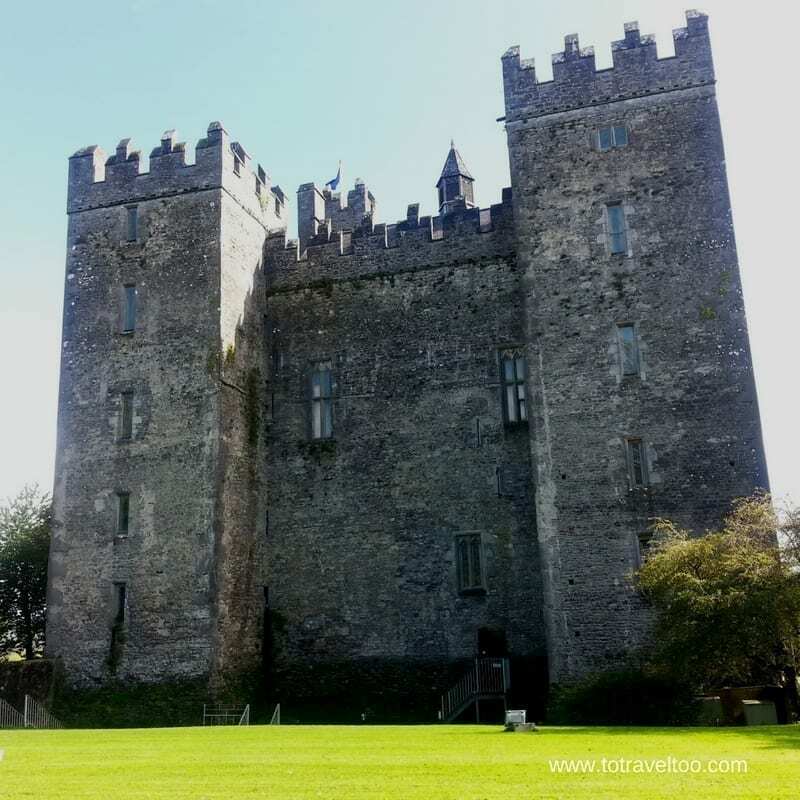 Read our review of Barberstown Castle here. and is easily accessible from all major routes (M1. M50, M4, M7). The village of Straffan, located on the River Liffey is close by. The small village of Celbridge also close by is the birthplace of Arthur Guinness of Guinness fame. As an alternative to enjoying dinner at Barberstown Castle, we can recommend The Duck Pub, located on English Row at Celbridge. There is a plaque showing that The Duck was the birthplace of Arthur Guinness. There are two routes available, we travelled the direct route on the M7 and it took us over 2 hours and we paid a toll of Euros 2. There is a toll on the M7 and other roads throughout Ireland, for more information on their location, details in regards to payment and the latest charges click here. Driving in Ireland on the motorways is easy but you may want to consider travelling the smaller roads for the local experience and the stunning scenery. Some roads can be quite narrow but if you take it slowly you will enjoy the experience more. No. 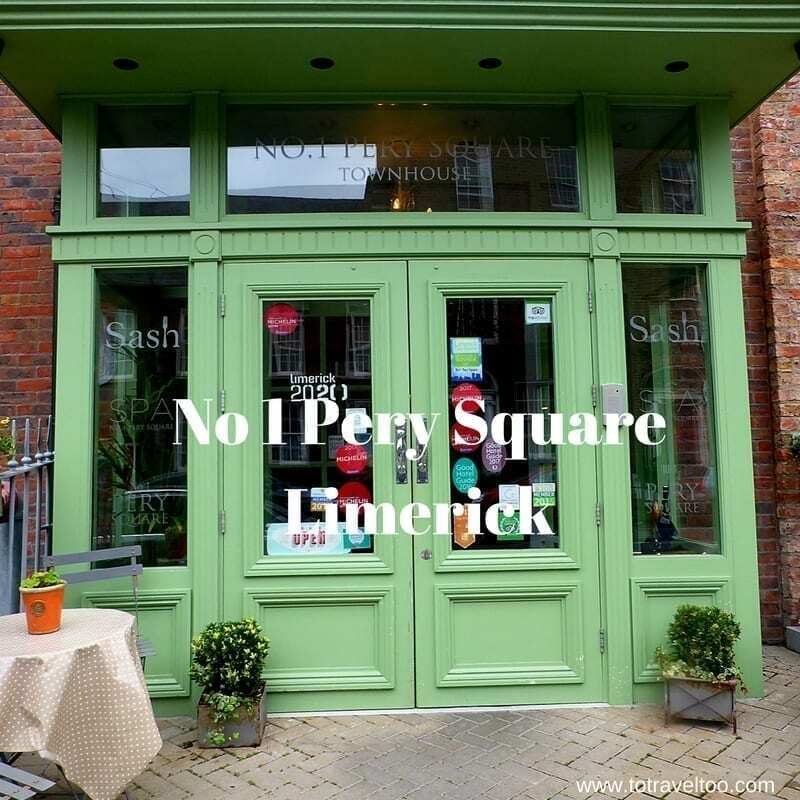 1 Pery Square is one of Ireland’s Blue Book properties, a boutique manor townhouse 5 minutes from the centre of Limerick consisting of 20 luxurious appointed bedrooms. 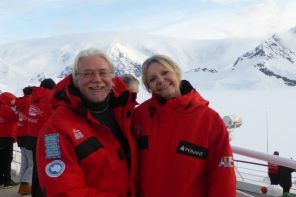 You will be welcomed warmly by the owner Patricia Roberts when you check in. Enjoy a luxurious spa treatment at their organic Voya spa and afterward enjoy a sumptuous dinner at Sash. Breakfast is a real treat, with so many options available. Read our review of No. 1 Pery Square here. John South Pub – the Limerick-born Author Frank McCourt who wrote wrote about the pub in the book. The toilets are named Angela and Frank not your usual Ladies and Gents. A pint of Guinness (2017) cost Euros 4.50 in each pub. Although only a 33-minute drive we were warned that it could take longer on the particular stretch of road, and the journey turned out to be more like 65 minutes. On a chilly afternoon in September, we arrived at The Mustard Seed to be welcomed by an open fire, coffee and smiling, friendly staff. A wedding party was due in a few hours and The Mustard Seed was buzzing with excitement. The Mustard Seed is a 17th century converted convent set in 10 acres of manicured lawns and gardens. John, the owner, could not be more welcoming. We were fortunate to enjoy one of their exquisite suites, 2 bedrooms upstairs and a sitting room with french doors opening out into the garden, and of course an open crackling fire that was lit ready to warm us. For a pre-dinner drink we walked into the small village of Ballingarry to enjoy a pint of Guinness at the Congrags Pub a 10-minute walk away. A pint of Guinness cost Euros 4. The Mustard Seed’s restaurant is award-winning and we would highly recommend when you check in you also make a reservation for dinner that evening. The food is excellent with a menu that is inspired by local seasonal fresh produce with an extensive wine menu to match. A memorable evening. 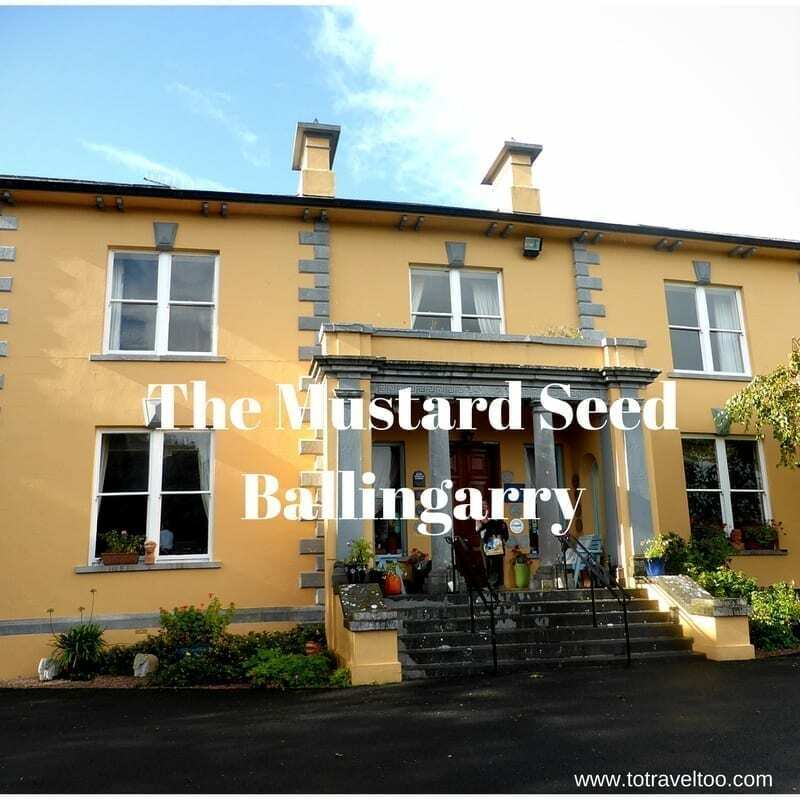 The Mustard Seed is one of Ireland’s Blue Book properties. Read our review of The Mustard Seed here. 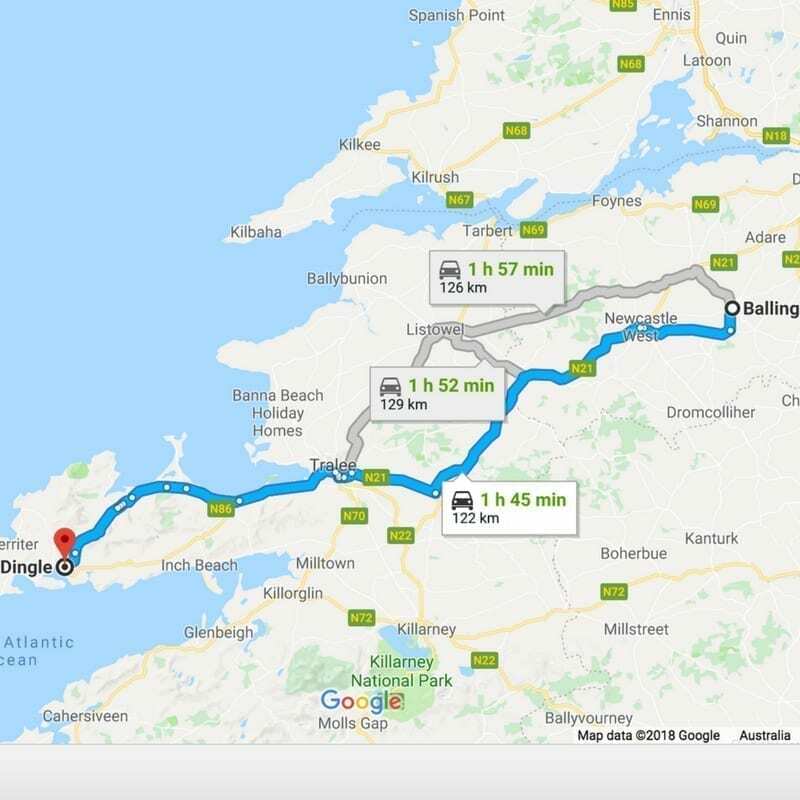 There are a few different routes from Ballingarry to Dingle, we took the blue route which took 2 hours. If you plan to attend just for the day, parking is an issue. We arrived at lunchtime and we drove around for at least an hour before parking about 2 km from the centre. It is definitely worth it but we would recommend booking accommodation months in advance so that you do not need to worry about parking and that you are right in the heart of Dingle and the music, the food and the fun party atmosphere or the ‘craic’! 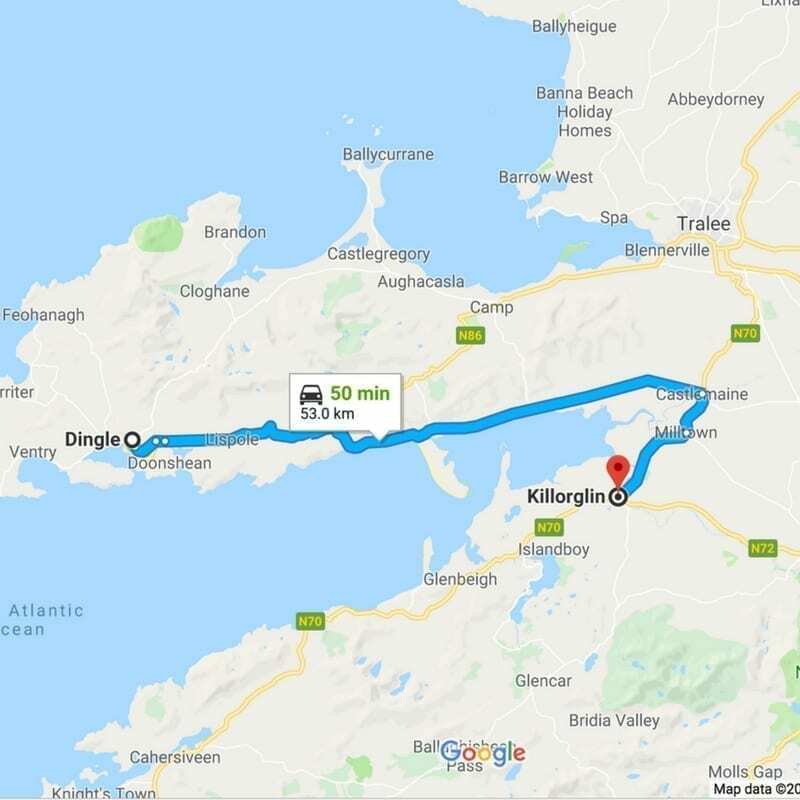 Our next destination was Killorglin a 50-minute drive from Dingle. The journey took around 1.5 hours because it is such a scenic route and we stopped along the way for photographs of the lush green countryside, quaint cottages and scenic ocean views. Don’t rush this particular route. The Ring of Kerry is a circular tourist route of 179 km around the coastline of County Kerry. 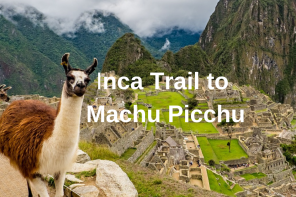 The road takes you through rugged forests, past spectacular rugged seaside cliffs, small fishing villages, pristine beaches and medieval ruins. Killorglin is the start of the famous Ring of Kerry. Family run Carrig Country House is located on one of the prettiest lake settings along the Ring of Kerry. There are breathtaking views of the lake and the majestic Kerry Mountains from the windows of your bedroom and the restaurant. The Victorian County Manor House’s idyllic location offers guests a tranquil respite from busy life. You can use Carrig Country House as a base to explore the Ring of Kerry. Carrig Country House is a member of Ireland’s Blue Book of properties. 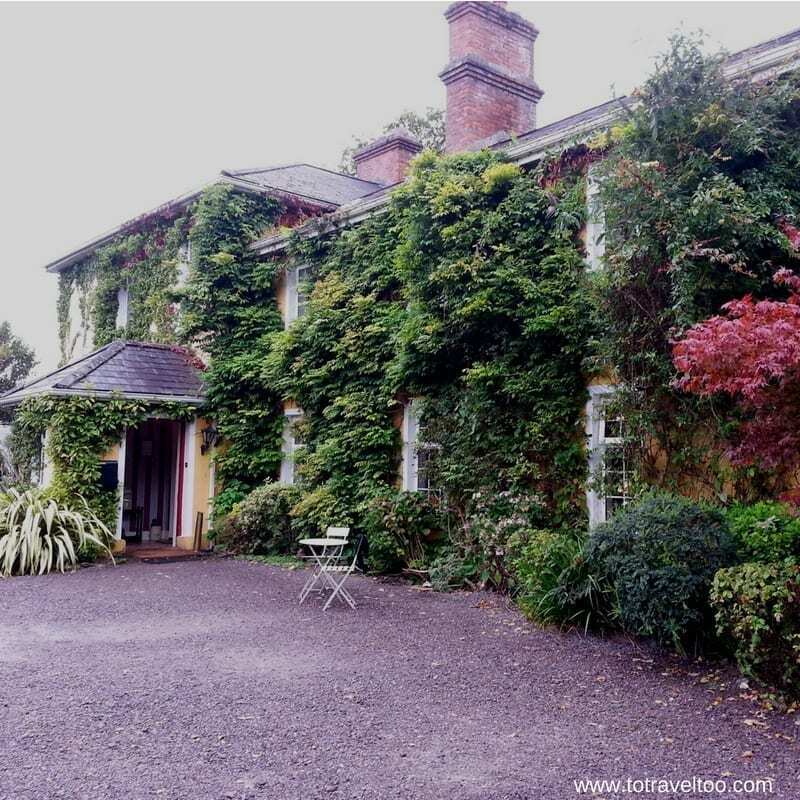 Read our review of Carrig Country House here. A relaxing evening starts with a pre-dinner drink (maybe a local Dingle Gin and tonic) by the open fire in one of the well-appointed reception rooms before you head into one of the finest restaurants on the Ring of Kerry. The menu boasts the best of local farm and garden produce, fresh fish and seafood from the Atlantic Ocean and an extensive wine list. We can recommend a leisurely breakfast before you head off to explore the Ring of Kerry. 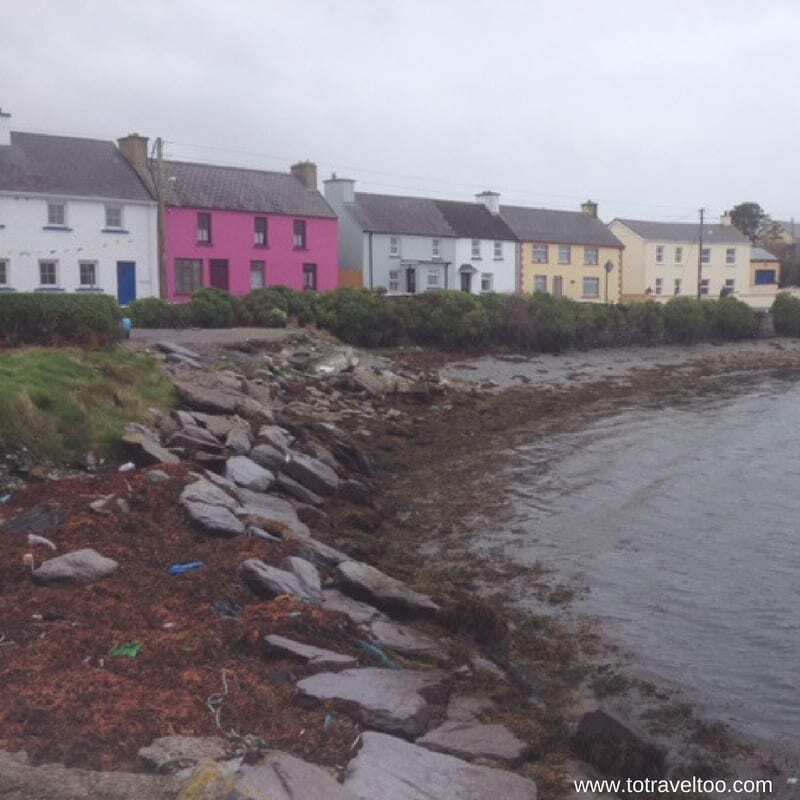 Portmagee is a small fishing village located on the Iveragh peninsula south of Valentia Island. It is a perfect spot to stop for coffee or lunch along the Ring of Kerry. Our desired route was the blue route, we were not disappointed by the Irish scenery along the way. 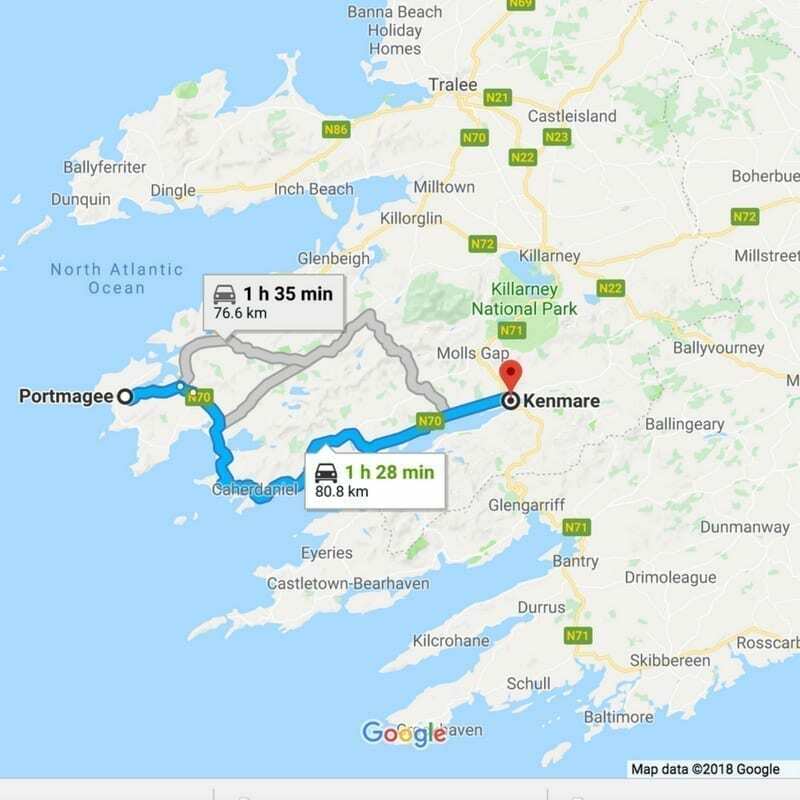 We left Portmagee and headed towards Kenmare the next stop on our itinerary. We took the blue route which took us more like 2 hours than the 1 hour 28 minutes recommended. One thing we will recommend is the journey’s we undertook took us longer than was recommended, so add in some contingency when travelling. 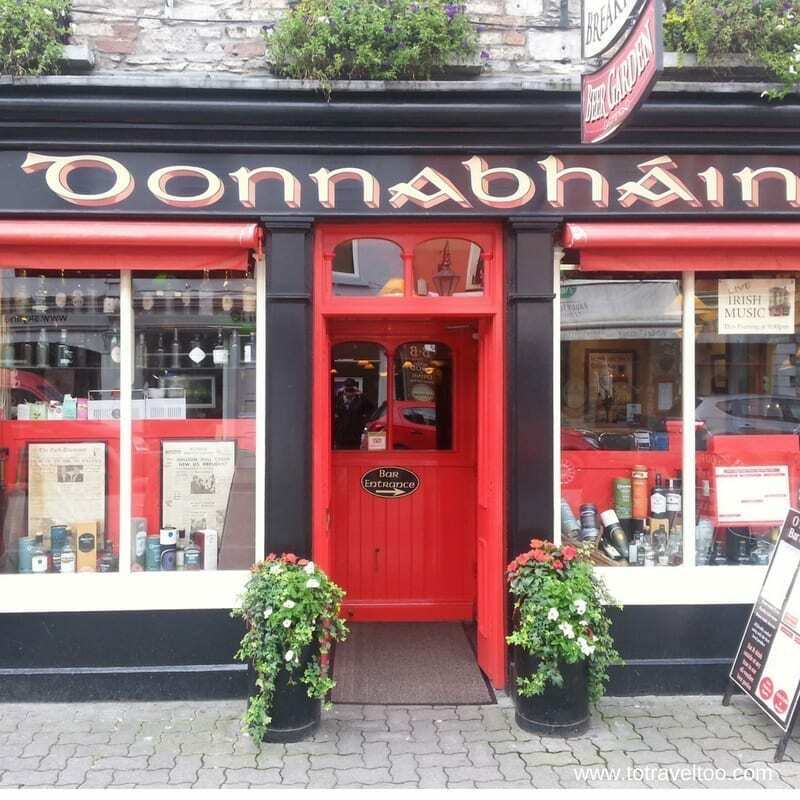 We can recommend dinner at O Donnabhans a few doors up at 10 Henry Street. A good menu and of course traditional Irish Music to enhance the evening’s experience. Kenmare is a market town and fishing port which lies at the head of Kenmare Bay. 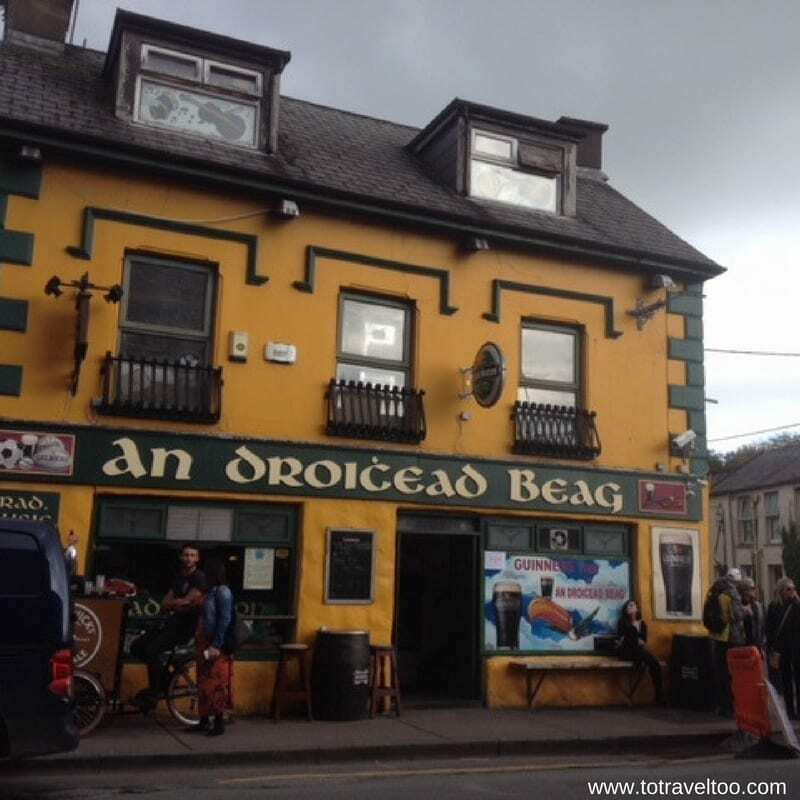 Kenmare covers two famous tourist routes the Ring of Kerry and the Ring of Beara. Actually, Kenmare means ‘head of the sea’ which refers to the head of Kenmare Bay. Private Mizen Head Tour through Killarney National Park via the Caha Pass and visiting villages along the way to Mizen Head. For the top restaurants in Kenmare click our link below. 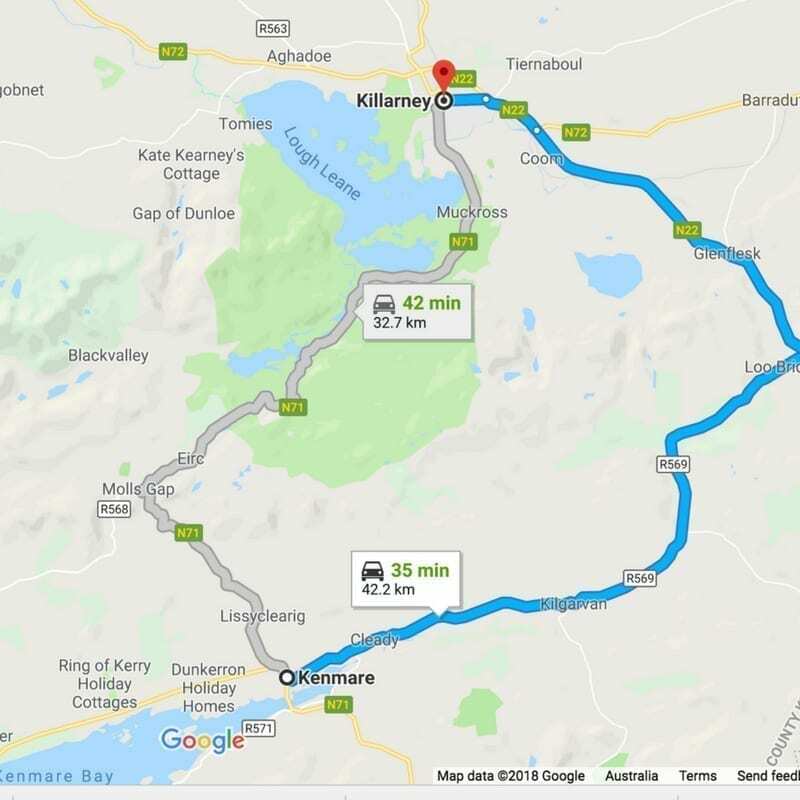 The next part of the journey from Kenmare to Killarney, still in County Kerry took around 1 hour via the blue route. It is a journey through pretty villages and scenic countryside. Killarney is located on the shores of Lough Leane which is part of the Killarney National Park. The Ring of Kerry begins and ends in Killarney, it is an important town in the region boasting Ireland’s tallest mountain Carrauntoohil at 3,406 feet and the Torc Waterfall. Killarney was placed on the map when Queen Victoria stayed there in 1861. Apparently, the Queen gave 6 years notice of her intending visit to Muckross House which gave the owners plenty of notice to redecorate. Queen Victoria arrived with her own bed and a 100 strong entourage. There is a lot of accommodation options for Killarney from hotels to bed and breakfasts and Airbnb properties. We spent 4 nights at the Gleneagles Hotel. The location was perfect, just a 15 minute walk into town for those nights that you have had a pint of Guinness or two at some of the fun pubs in the centre of Killarney. 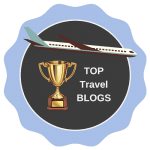 For the top restaurants in Killarney as voted by travellers for Tripadvisor click our link below. 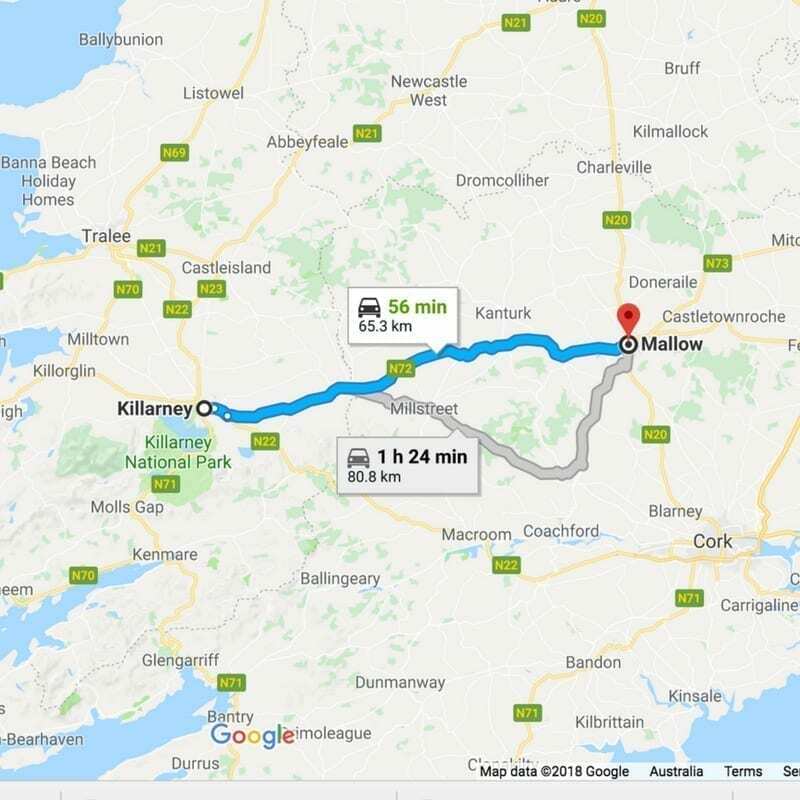 There are two available routes from Killarney to Mallow, we chose the blue route for the 1-hour journey. Mallow is located in County Cork about 35km north of Cork. Mallow is a quaint market town, lovely to wander around and is famous for its racecourse known as Cork Racecourse at Mallow. 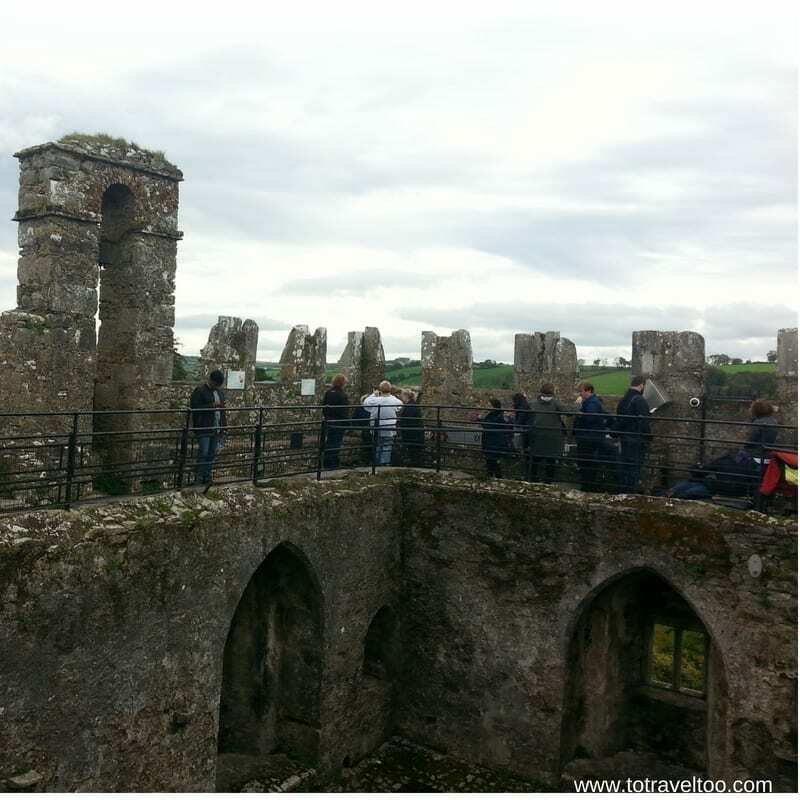 Your Ireland Itinerary should include Kissing the Blarney Stone at Blarney Castle 26km from Mallow (2018 prices Euros 18 per person) – it is a fun thing to do but you do need to bend backwards to kiss the stone and there could be a long wait. But it is worth it. We enjoyed a Fab Food Tour in Dublin and they also have one in Cork. 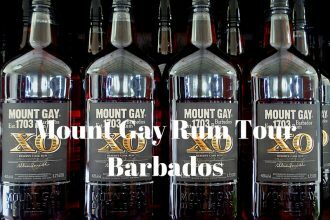 A great way to enjoy tasting local cuisine and learning about the city at the same time. Longueville House is a Georgian Manor House on 500 acres 26 km north or Cork City. A perfect location to base yourself whilst travelling around County Cork and Cork City itself. A dinner reservation is recommended at the Presidents Restaurant where you will dine on a fine menu based on what is seasonal from the Longueville House garden. You will not be disappointed staying in one of the luxuriously appointed 20 bedrooms with stunning views over the Blackwater Valley. Direct from their own apple orchard you must taste Longueville’s own award-winning apple cider and apple brandy which they have been distilling on the property for over 30 years. 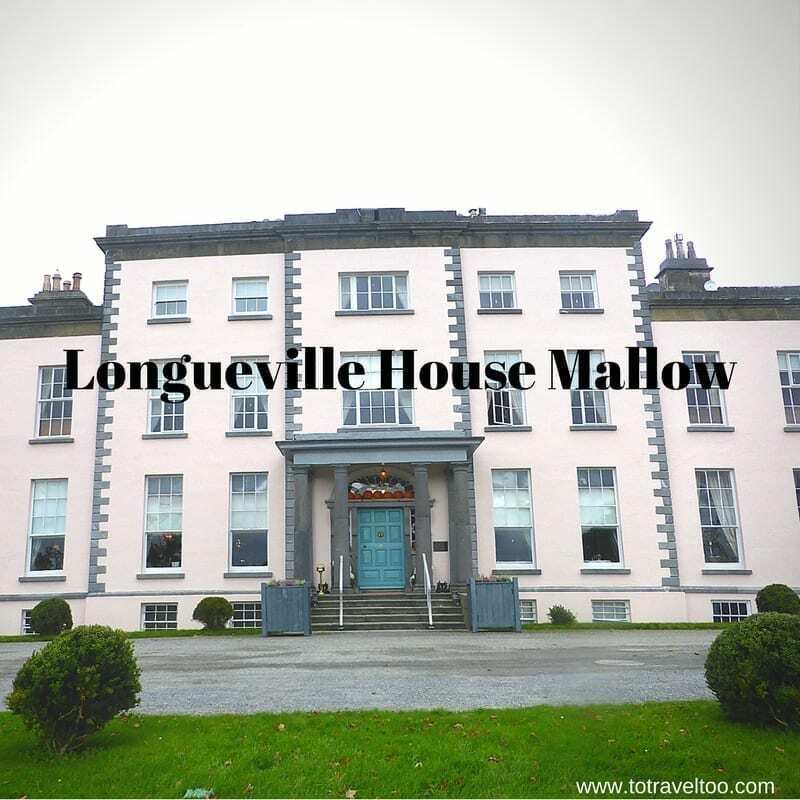 Longueville House is a member of Ireland’s Blue Book properties. Read our review of our stay at Longueville House here. 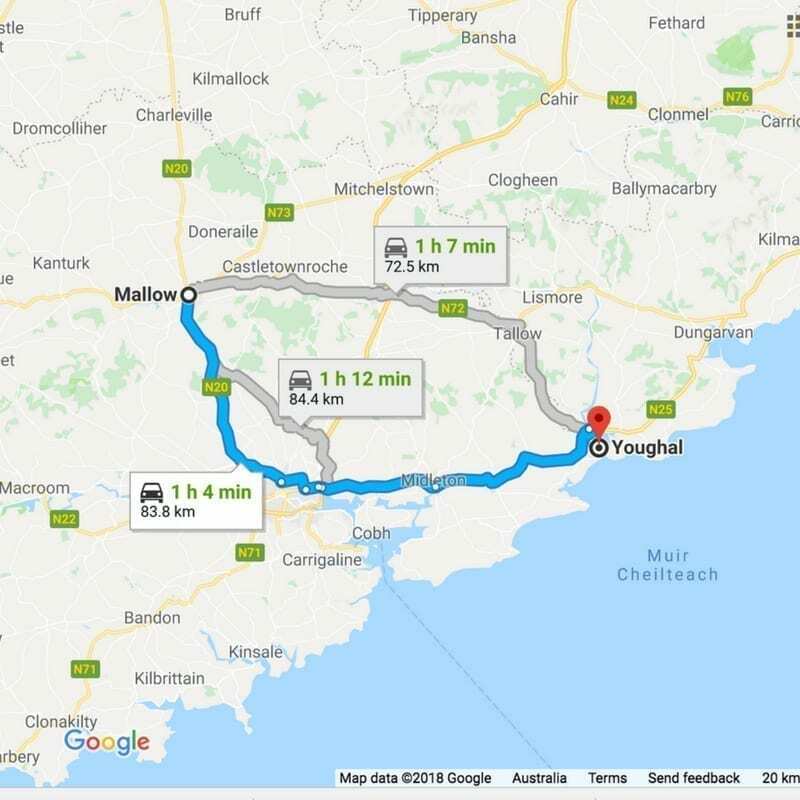 We travelled the blue route from Mallow to Youghal taking us 1.5 hours. 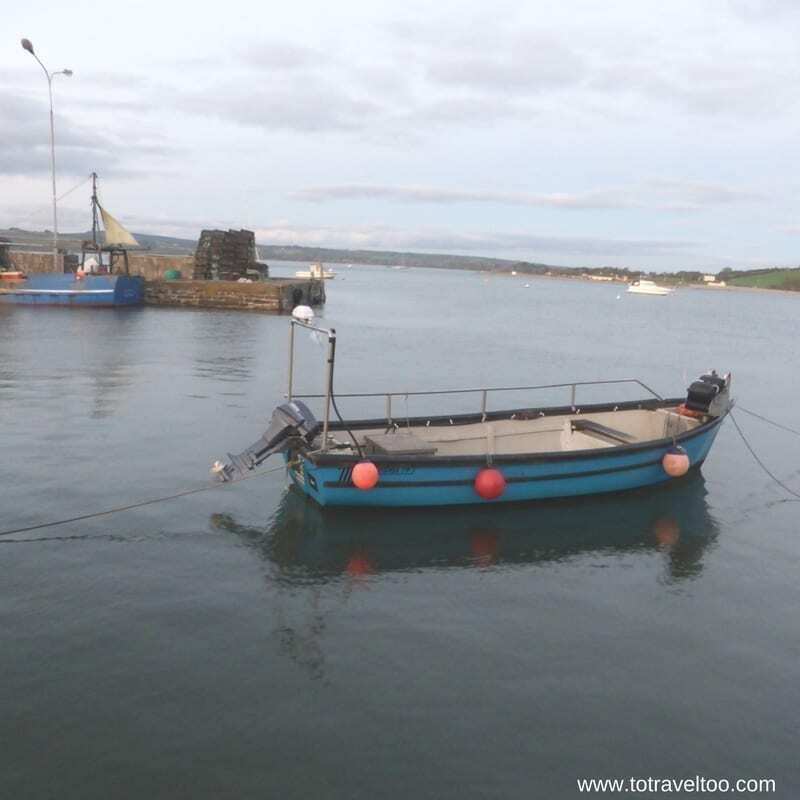 Youghal is situated on the River Blackwater, it is a popular seaside resort in County Cork and well worth a visit. 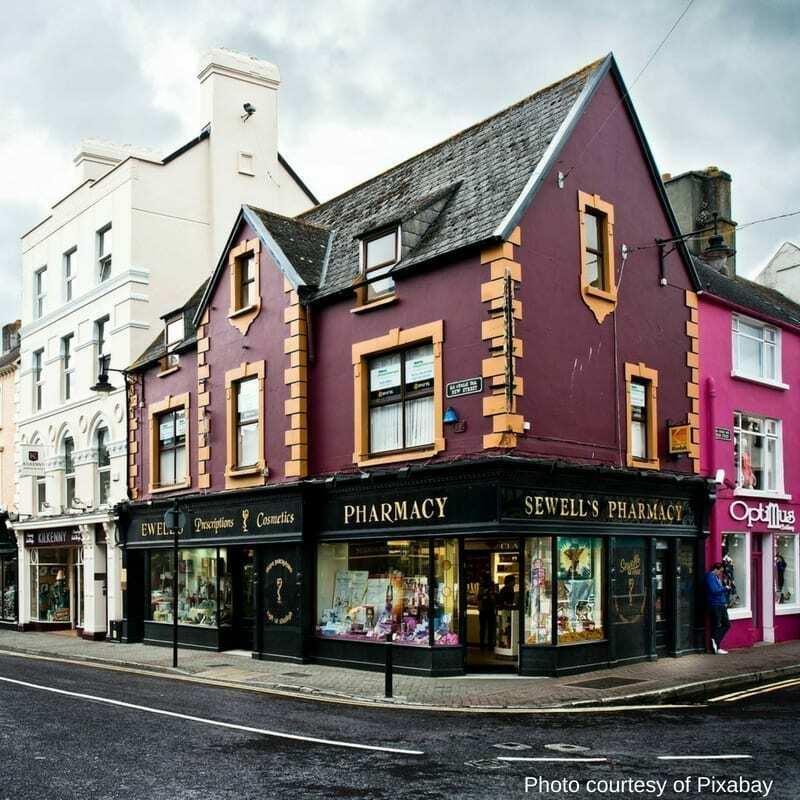 Youghal is a medieval walled port town that can trace its origins back to the Vikings. The port traded goods as far as Europe and as close as Bristol and became a very important trade port for exporting wool in the 17th century. We stayed at Youghal’s premier hotel Aherne’s Townhouse Hotel and of course we had to try out their famous Seafood Restaurant. Read our article review on Aherne’s Townhouse Hotel here. After we checked into our large room at Aherne’s we wandered around town and headed up towards the Lighthouse. On our walk back through town, we headed towards the seafront and enjoyed some local Irish hospitality and a few Guinnesses at the Quayside. The Irish have such a fun sense of humour and everyone who walks into a Pub is a friend, everyone will chat with you even if you don’t want to chat. The Irish are some of the best storytellers in the world and the couple that we met were one of the funniest. 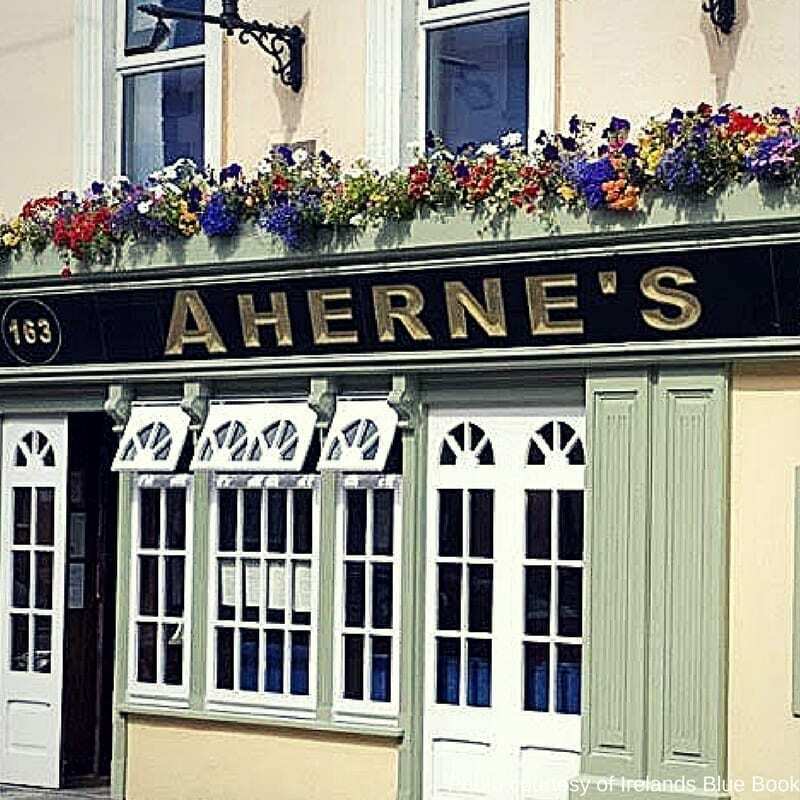 At Aherne’s, you have the choice of their famous restaurant or the bar to dine in. The menus are extensive and we can recommend trying their homemade soda brown bread or their homemade tomato white bread baked daily in their kitchen. Aherne’s is a member of Ireland’s Blue Book of properties. 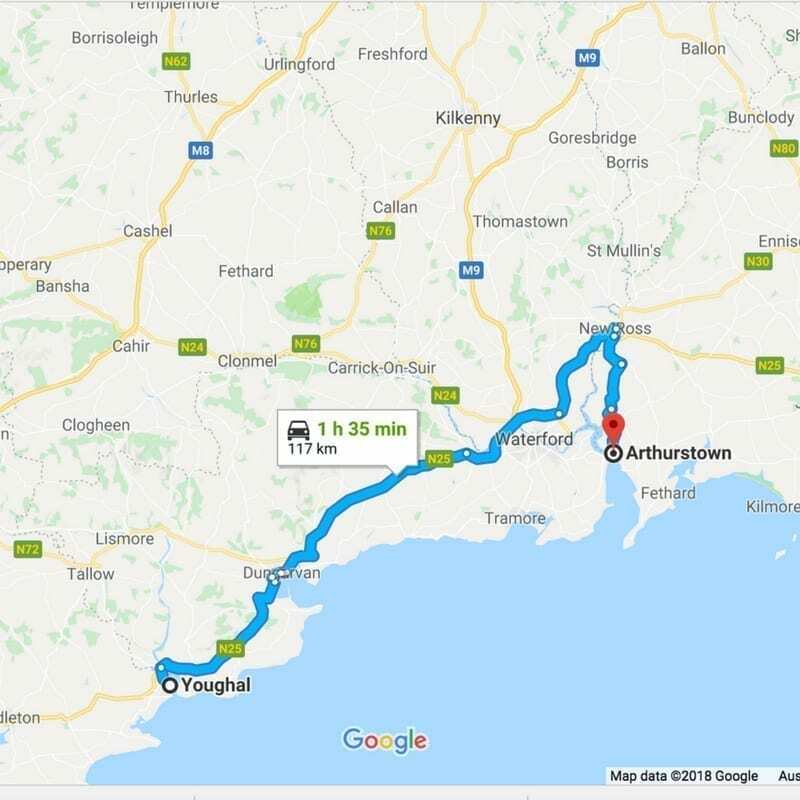 There are two ways to travel from Youghal to Arthurstown, our next destination. 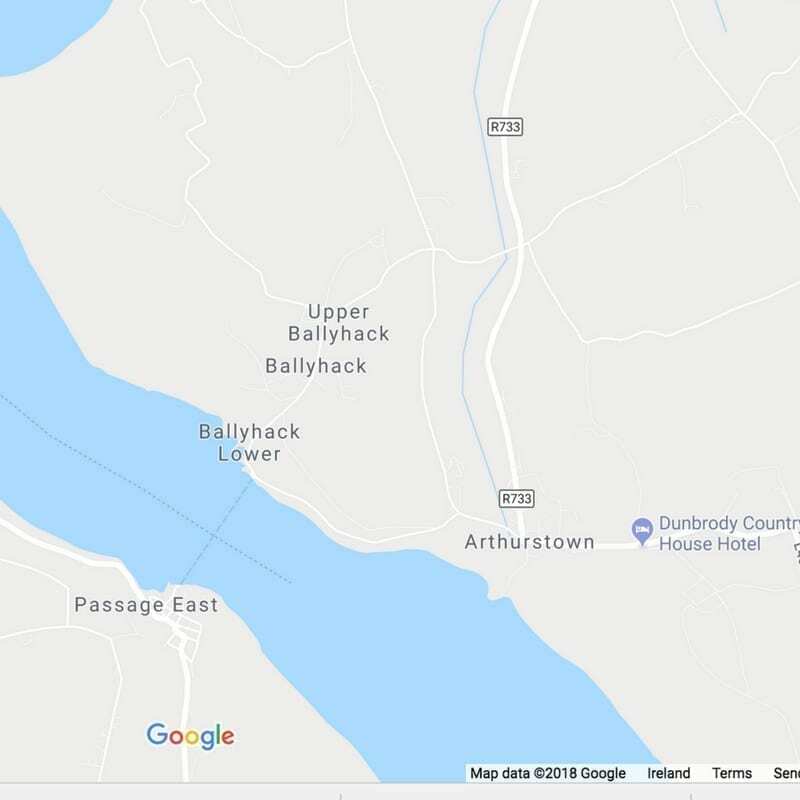 Our blue route took us up to New Ross and then down to Arthurstown or you can head to Waterford and catch the ferry across to Lower Ballyhack. If you drive the blue route we can recommend stopping at New Ross and take a tour of the Dunbrody Famine Ship. 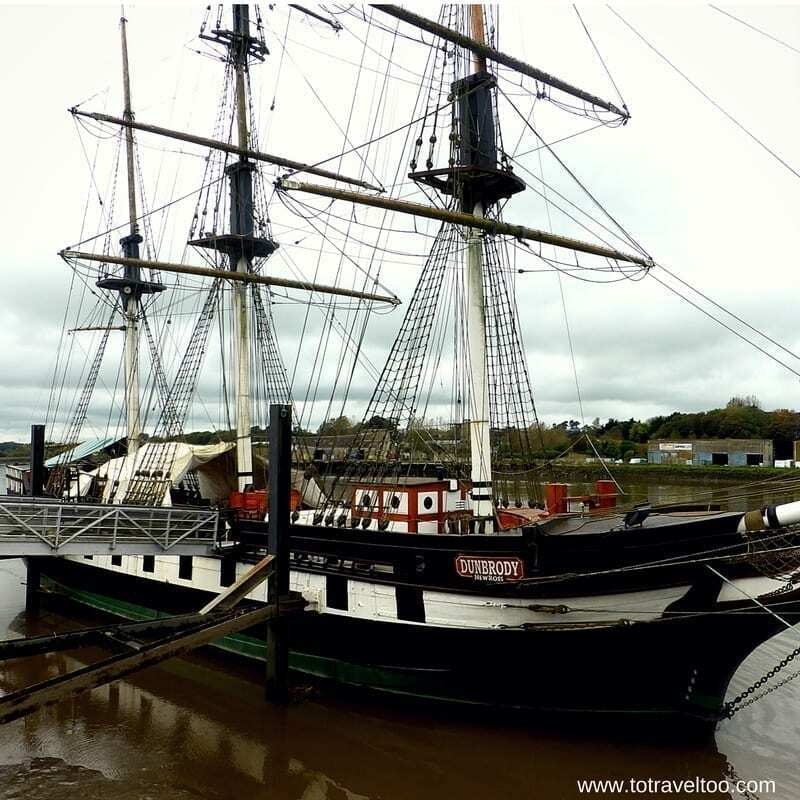 The original Dunbrody Famine Ship was built during 1845 in Quebec as a cargo ship to export timber from Canada, guano (a type of fertiliser) and cotton from the USA’s southern states. When the potato famine hit Ireland there were not enough passenger ships to carry emigrants to the USA as they fled Ireland looking for work and a better way of life, the Dunbrody was used for their transportation. The Dunbrody Experience at New Ross takes you on a tour of what the emigrants experienced on their journey across the Atlantic, their living conditions on board and the fate of those who survived the journey played by costumed performers. 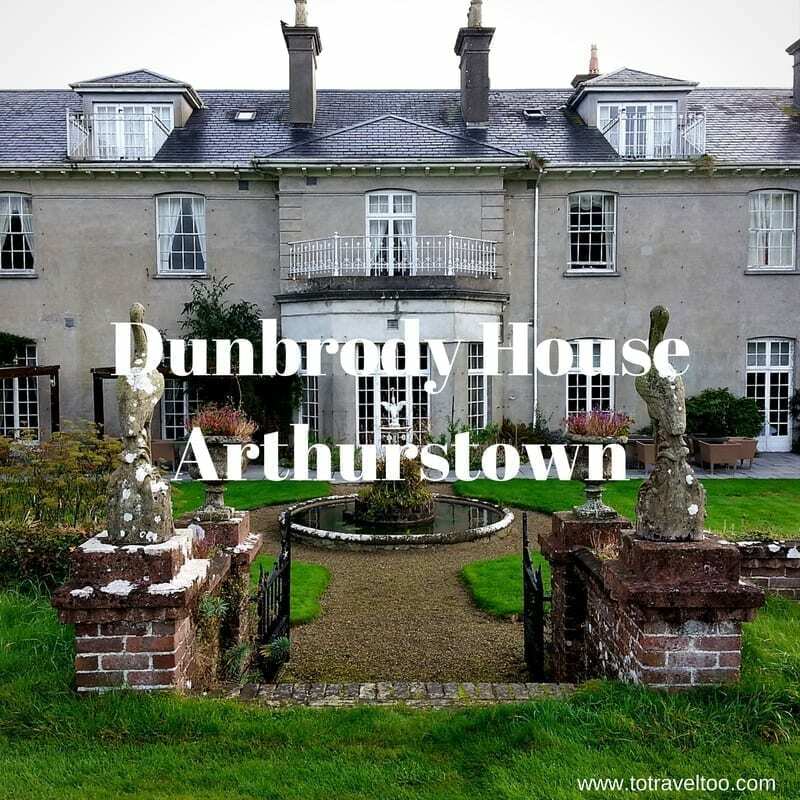 Dunbrody House is owned by Irish Celebrity Chef and Television personality Kevin Dundon and his wife Catherine. Dunbrody House is a Georgian Luxury Boutique Hotel on 300 acres on the Hook Peninsula. Not only will you dine at their Gourmet Restaurant, you can enjoy champagne and seafood at their bar, drink a glass or two of craft beer at “The Local”, attend classes at their cookery school and after enjoy a relaxing spa. You will be warmly welcomed by Catherine and their team and stay in luxuriously appointed bedrooms. We enjoyed a memorable 2-night stay (wish it had been longer). Dunbrody House is a member of Ireland’s Blue Book. Read our review of Dunbrody House here. Waterford is famous for Waterford Crystal – you can take a 1-hour tour to learn how the world’s expert create masterpieces. 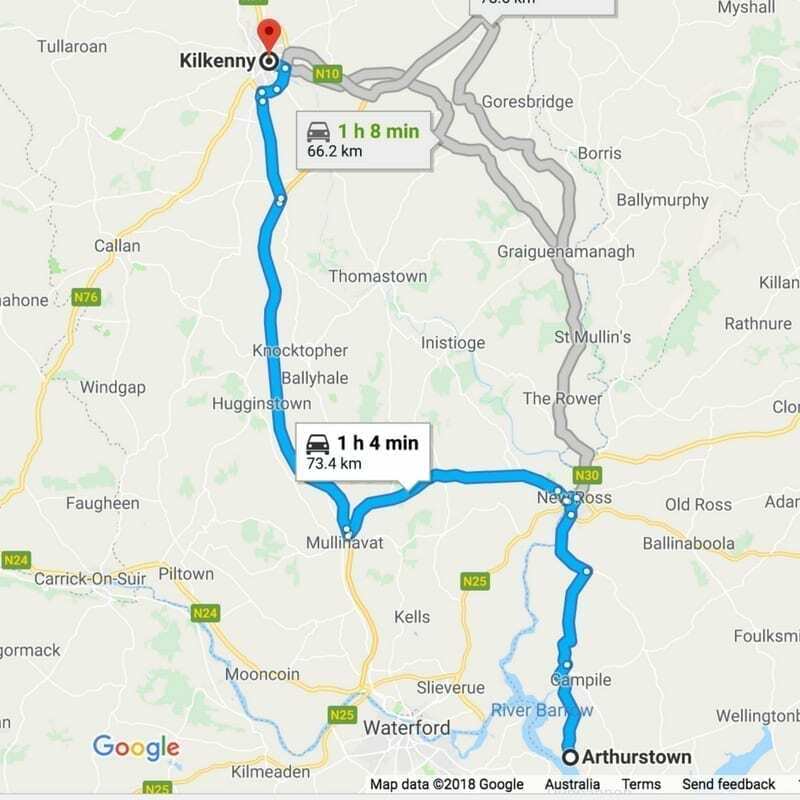 As the journey is only a short distance you may want to spend a few more hours in Waterford or visit some smaller towns such as Clonmel (just off the above map after Carrick-on-Suir). 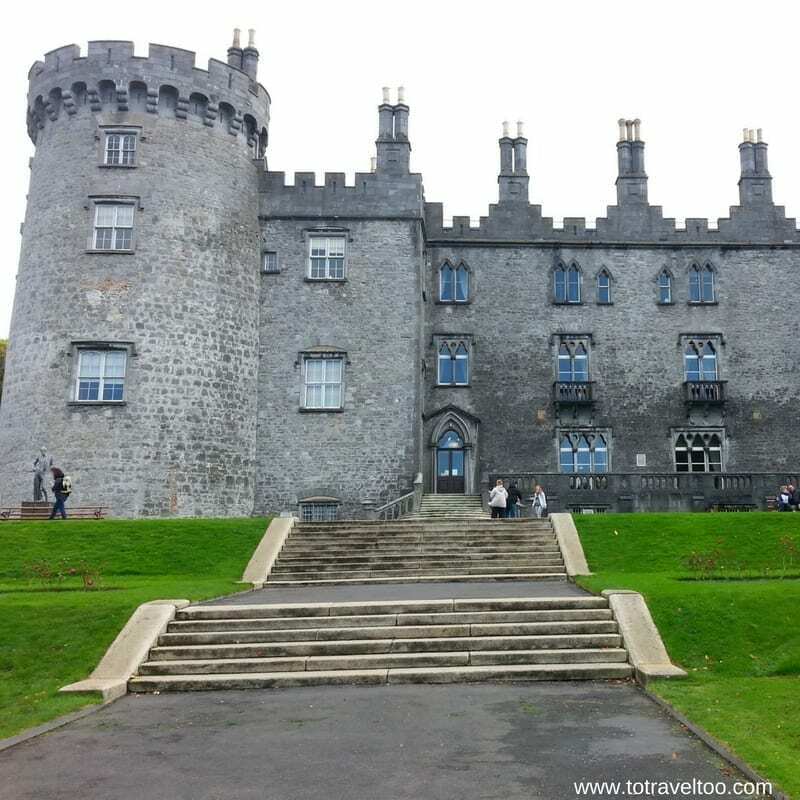 Kilkenny is a medieval city in County Kilkenny situated on the banks of the River Nore. The major tourist attraction of the city is Kilkenny Castle. Kilkenny’s Medieval Mile is located in the heart of the city and is a maze of narrow lanes, ancient buildings that lie between the castle and the cathedral. The Tourist Information Centre has a wealth of information for the visitor and we could recommend that you book a walking tour. There is certainly enough to do if you spend a few nights. We chose accommodation in walking distance to the city at Kilkenny Inn Hotel (15,16 Vicar Street) which also had parking for guests at the rear. 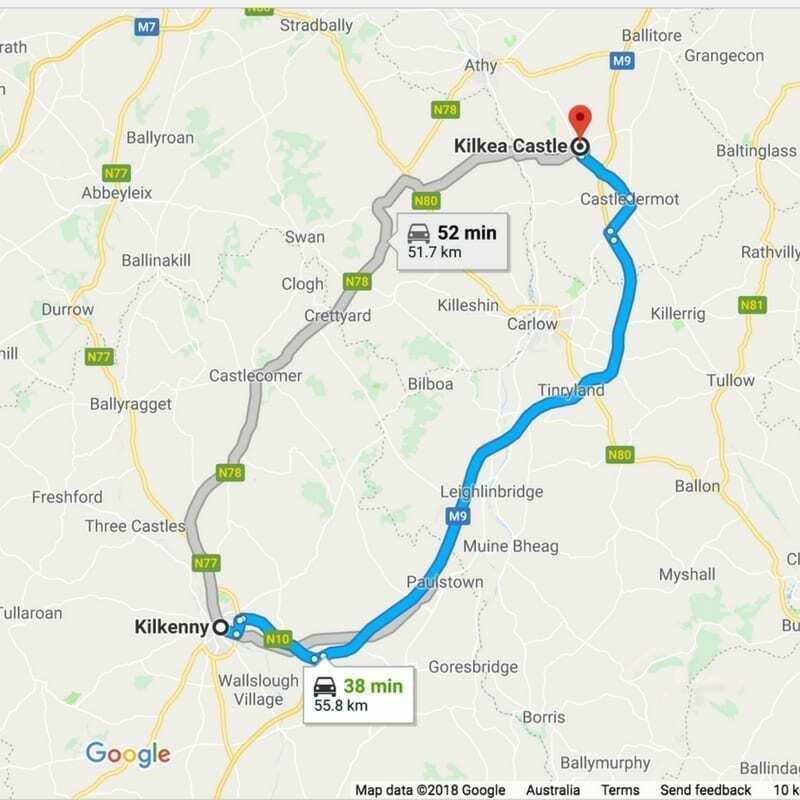 There are two available routes from Kilkenny to Kilkea Castle. Kilkea Castle in County Kildare is one of the oldest inhabited castles in Ireland and dates back to 1180. Kilkea Castle and Golf Club is majestic. From the moment you drive up the long leafy driveway, you feel that you are entering a kingdom of lords and ladies and royalty. Kilkea Castle has different accommodation options available either staying in the Castle in its luxurious rooms, to the Castle Carriage rooms and the Lodges. We stayed in one of the luxurious lodges and dined at Hermione’s Restaurant with its stunning views over the castle grounds. The grounds are lovely to walk around especially the old church and its small graveyard. 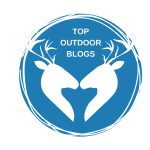 Read our review of Kilkea Castle here. 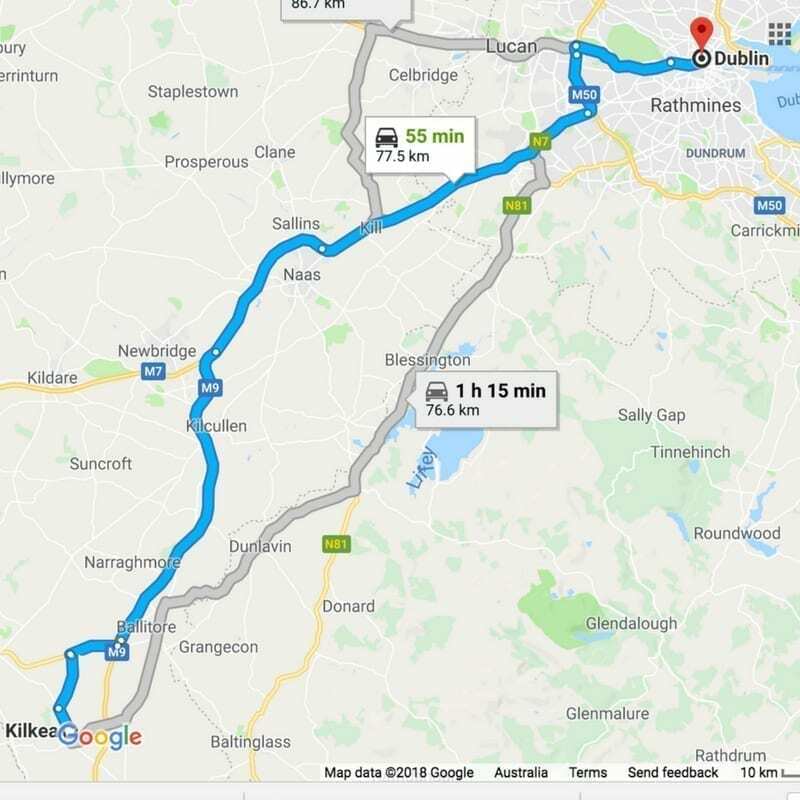 Two options for the journey to Dublin, we took the blue route. 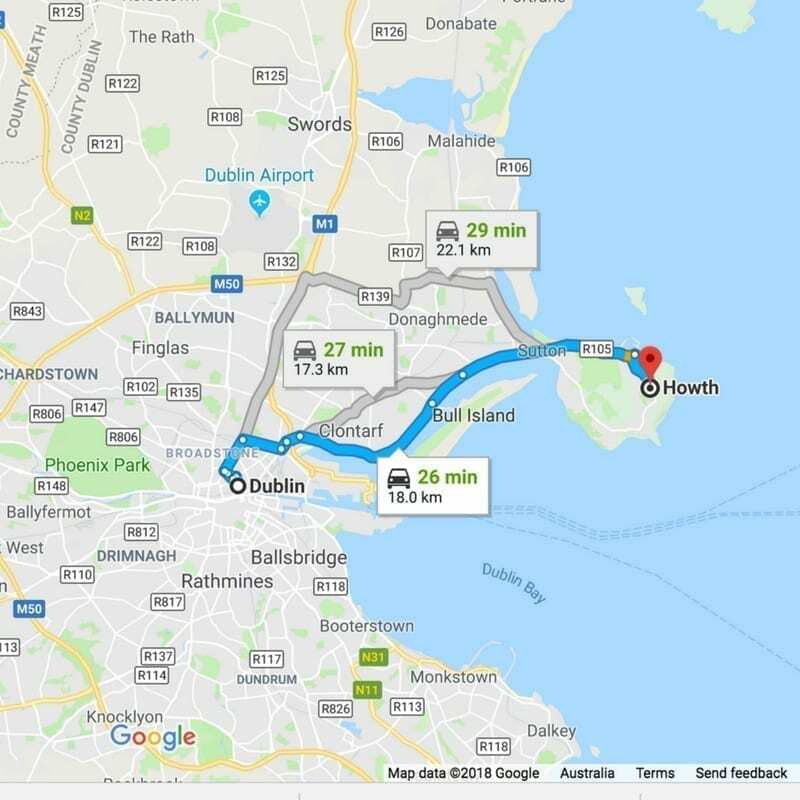 We had to return the rental car to Dublin Airport and made the decision to drop our bags off first at our hotel and then drop the car at the airport. That decision was an easy one and one that we would recommend. The airport bus from the airport dropped us close to Temple Bar where we enjoyed a walk around the cobblestoned streets and had a pint of Guinness at the famous Temple Bar. Such a buzz, Irish music playing, the pub was packed with tourists and locals and a great way to spend a few hours in Dublin. 2 pints Guinness at the Temple Bar Pub Euros 13. 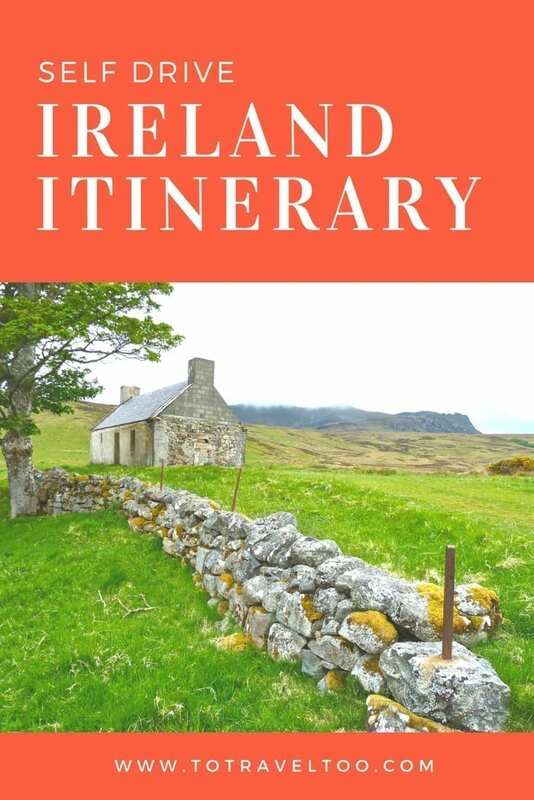 Before you head to Dublin you may want to do more research, we can recommend the Lonely Planet Ireland guide book for the latest tips and tricks. 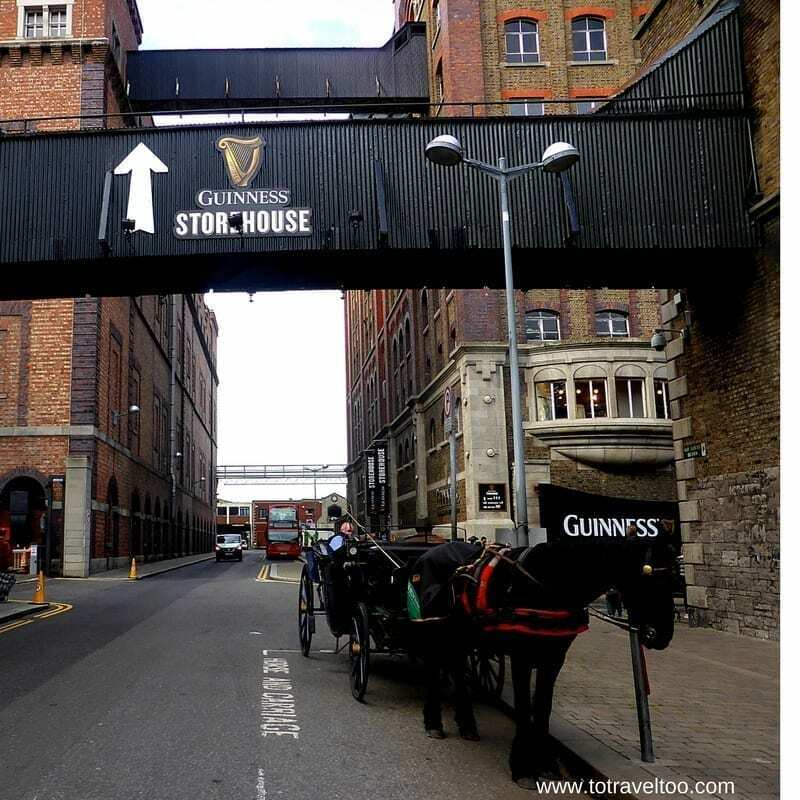 There are many options in Dublin from pubs, to cafes, bars and restaurants. Tripadvisor has an extensive list of restaurants to suit all cuisines and budgets. Do not miss a visit to Howth. We caught the train from Dublin to Howth from Connolly Station. The DART train departs every 15 minutes and takes 25 minutes. As of 2018 the return day trip fare – Euros 4.70. Howth is a small fishing village on the outskirts of Dublin. Howth is famous for its seafood restaurants, fishing and hiking the hills. You can also visit Howth Market close to the train station or visit Howth Castle. The perfect place to stay on the water’s edge is at King Sitric. We can recommend dining at both of King Sitric’s restaurant options, their premier fish restaurant on the 2nd floor overlooking the bay or the East Bay Cafe below. All luxurious bedrooms overlook the Bay and you fall to sleep lulled by the gentle lapping of waves at the shore. The King Sitric is in an ideal location for Dublin airport being only 20 minutes away, but don’t just stay one night. 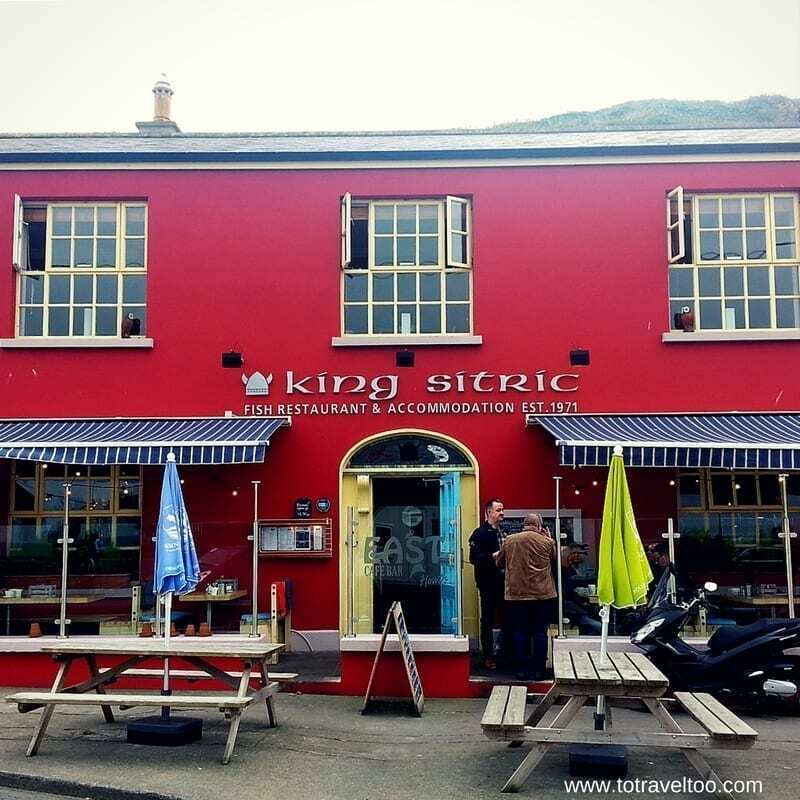 The King Sitric is one of Ireland’s Blue Book of Properties. Ireland’s weather can be unpredictable. We travelled late September and early October and yes it was damp and cold most days and when the sun did come out it was hot. Layers are definitely the go. 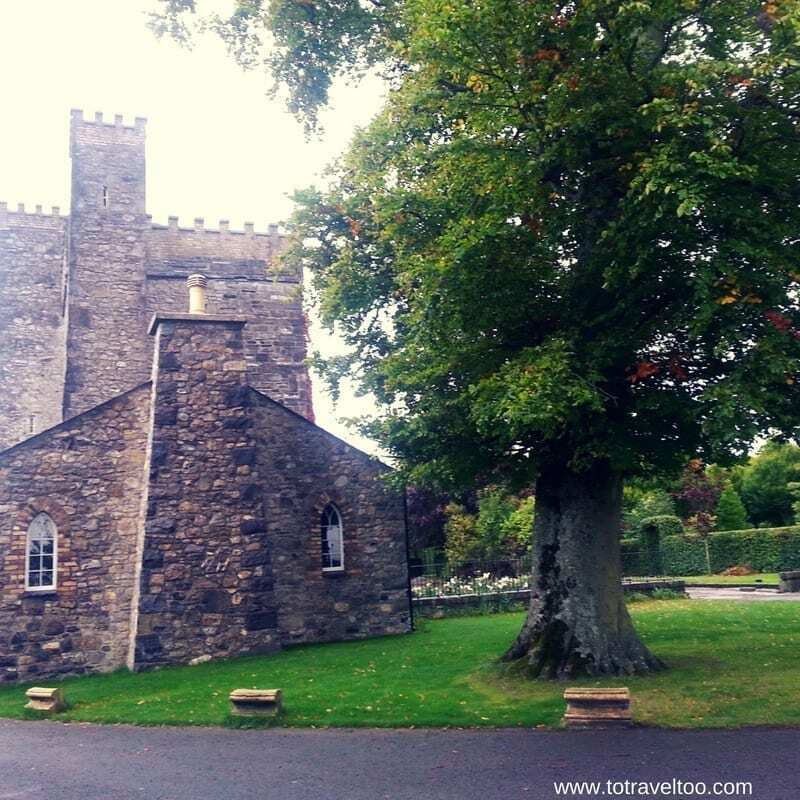 Here are some recommendations for you to pack for your self-drive Ireland itinerary. Since we started travelling in 2012 we have walked thousands of miles in Merrell Walking Shoes. Layering is the ‘go’ in winter and thermal underwear is lightwear with plenty of warmth. Don’t forget your hat, gloves and scarf! Dublin Airport is located 5.4 miles north of the City. Dublin is serviced by all major carriers and budget carriers. If you prefer a private transfer click here for more details. 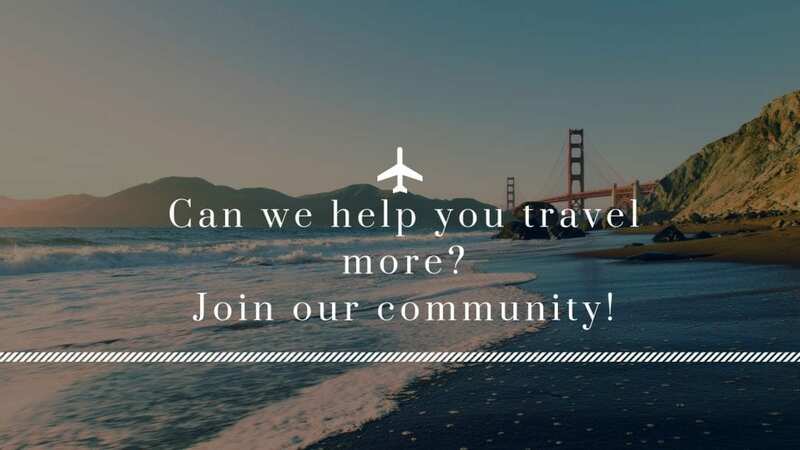 We always recommend travel insurance when you travel. 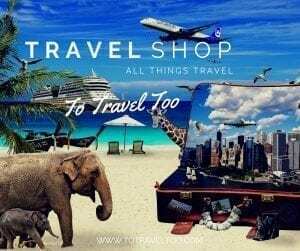 The best time to take out travel insurance is when you start paying for your accommodation, flights or deposits on tours and cruises. For those based in Australia click here for details. For those based outside Australia click here for details. Awesome road trip! I am amazed how cheap it is to hire a car for 2 weeks and the cost of the petrol is also crazy cheap! So putting that as an option if ever I visit. 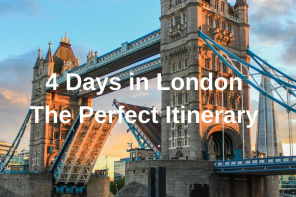 A very comprehensive itinerary, chock full of useful information. 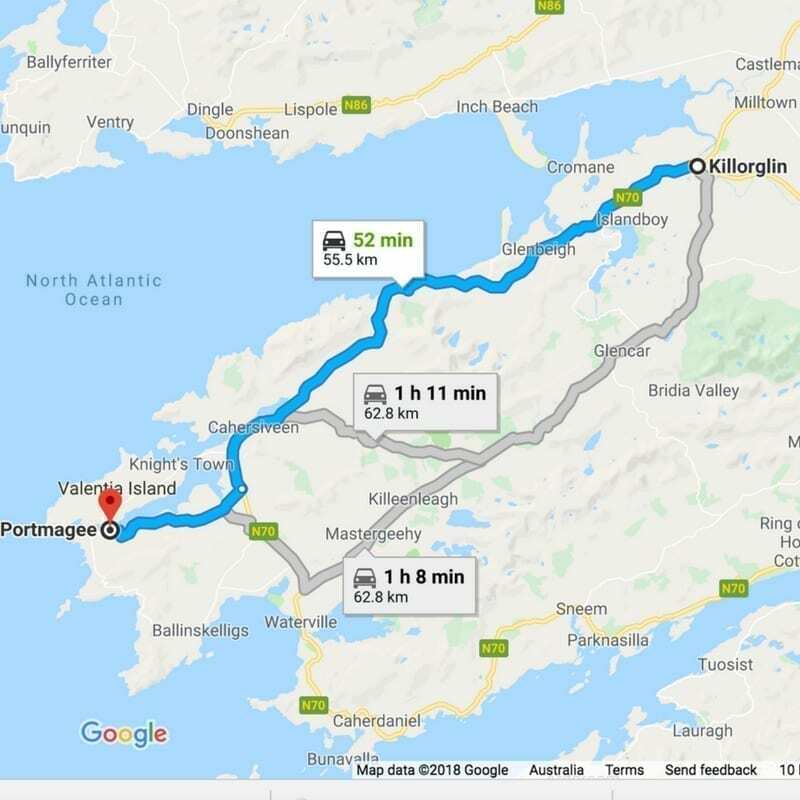 I’d love the go on the Ring of Kerry through the forest and fishing villages and I’d love to visit Cork too as I do have some distant relatives there. What’s the best time of the year for safe driving conditions? Thank you for your comments. We travelled in September and the roads were good then but I guess once the full force of winter arrives it could be quite difficult to manage the smaller roads around the Ring of Kerry. We have got to return one day. Wow, I’m impressed, Jane! You guys did a lot of driving around Ireland. It’s unbelievable how inexpensive car rentals are there. 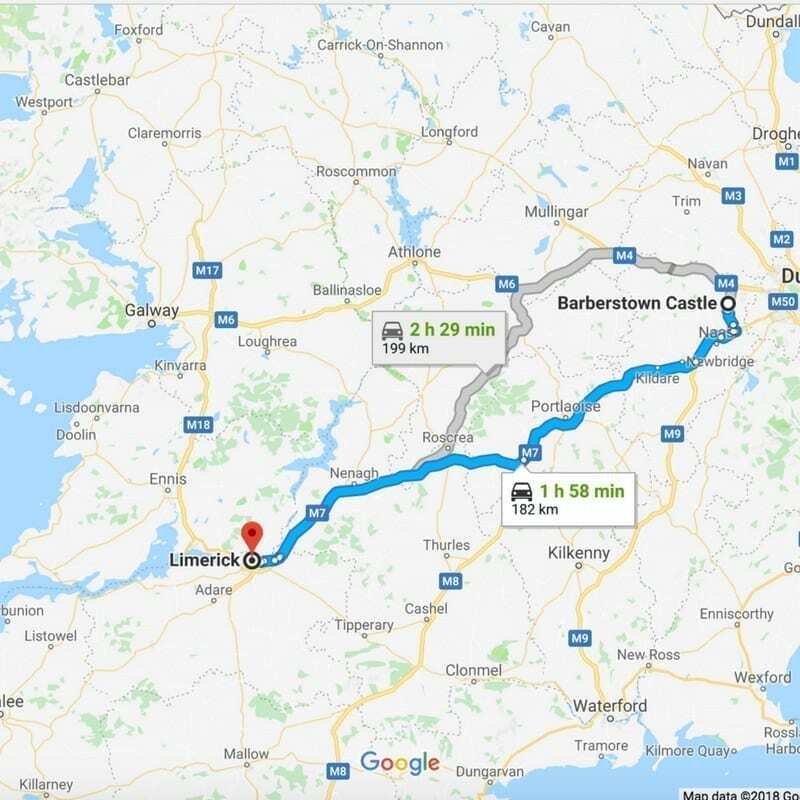 I’m glad I came across this detailed guide because my husband and I have been discussing about a road trip in Ireland. I’ve heard about their breathtaking landscapes. Besides, staying in historic castles and manor houses is always fascinating. Thank you for your comments Anda. Ireland is a very special place and you will enjoy your travels there. Totally agree that Ireland is such a great destination for self-driving! The roads are a pleasure to drive, and there’s so much to see that’s best reached by car rather than trying to do it by train or bus! 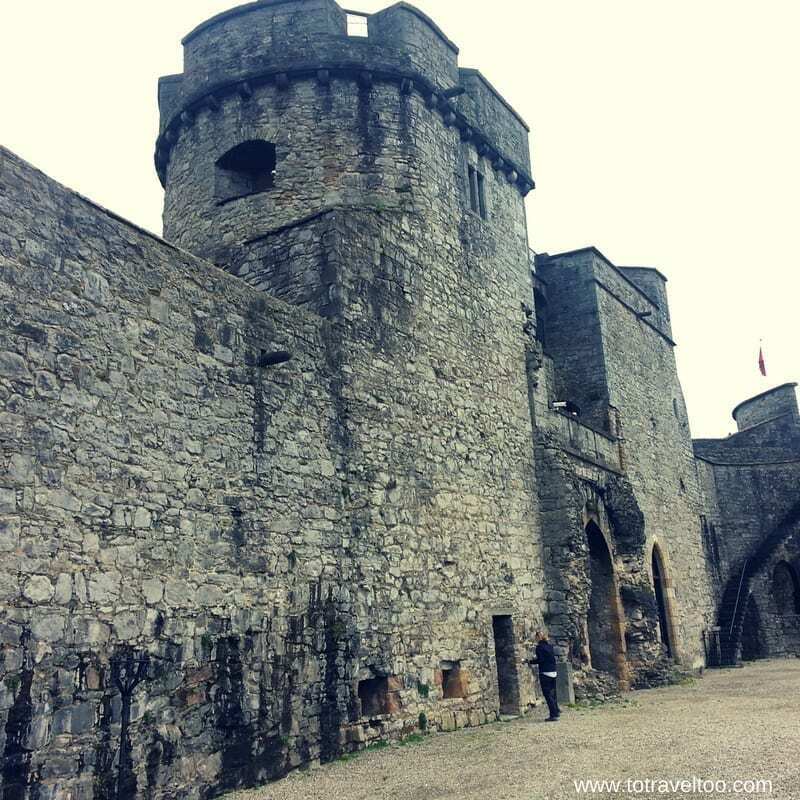 Your itinerary takes in many of the stops I also visited when doing a driving tour with my friends, many years ago, including my favourites of Blarney Castle and of course, everything about Dublin! Thanks Kavita for your comments. A fascinating and welcoming country, and one that we will return to. 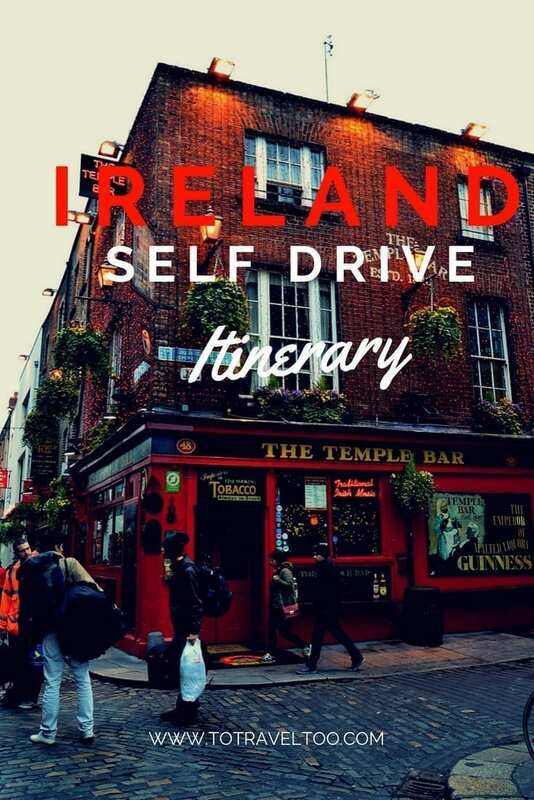 I have always wanted to go to Ireland and this self drive itinerary seems like an excellent idea, I would love to try this out. Your photos are inspirational and really make me want to visit. Those manors are stunning, I would surely enjoy this. Hi Ann, thank you for your comments. Our favourite adventure staying in those amazing castles. Hi Daniel, glad we could help. If you need any more information please reach out to us. Wow you had a real self drive adventure around Ireland! I love visiting, and haven’t seen nearly enough. I love Killarney, and would return to that region in a flash. You also managed to see so many great castles and scenery along the way! A beautiful country for sure. Thank you Lisa for your comments.It really is a beautiful country. I just love castles and old things, so this is a perfect itinerary for me. All the castles look worth visiting. Thanks for the maps and routes, very useful for first-time visitors of Ireland. Thanks Sinjana for your comments. Ireland is one of our favourite countries. 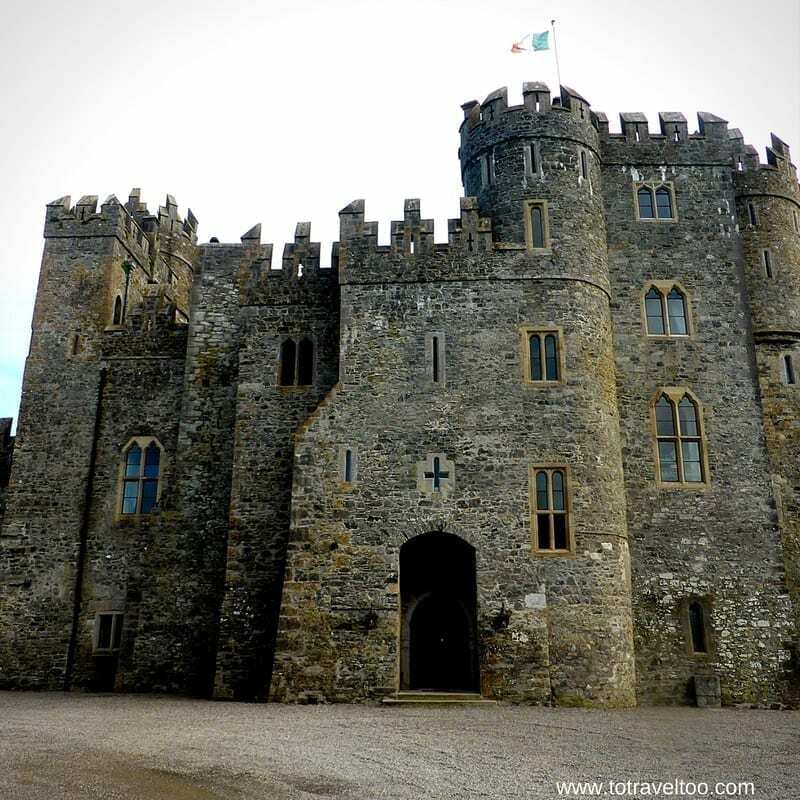 What an amazingly detailed itinerary for visiting Ireland’s castles and manors! 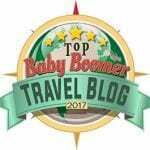 I appreciate the suggestions on where to stay, what to see from each base, even where to eat. I also appreciate your budget disclosures since it helps us plan our own budget more accurately. While I’ve seen many self-drive itineraries, I can’t believe how cheap the car rental was! It certainly motivates me more to look at that option. And I’ll be drinking a Guinness and toasting you when I go! Hi Annick thank you for your comments. Look forward to the Guinness toast! This is one of the main reasons why I love Ireland. I had visited a couple of times but never really considered self-driving. You just inspired me to do this during our next visit. This itinerary is so helpful. Bookmarked it for future reference. This is the most detailed post I have ever read. Thanks Clarice for your comments on Ireland. I really love this country and could return time after time. Awww… I miss UK! There are such splendid castles and manor houses everywhere there. I did visit a fair share in England when I was there. I missed visiting Ireland though. Hope I’ll get a chance to visit them! Ring of Kerry in Ireland is where I wanted to visit. But somehow it didn’t work out! Your stay at No1 Pery Square sounds divine! To be able to stay at a Manor House is definitely something. Stays in manor houses and castles are unique and hold great memories. Hope you can get to visit one day.